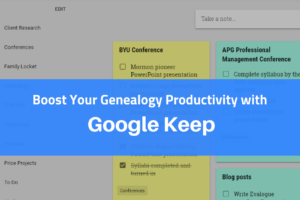 Are you determined to learn how to organize your multitude of genealogy related papers? Have you always wanted to attend RootsTech? 2018 is the year where you can do both. 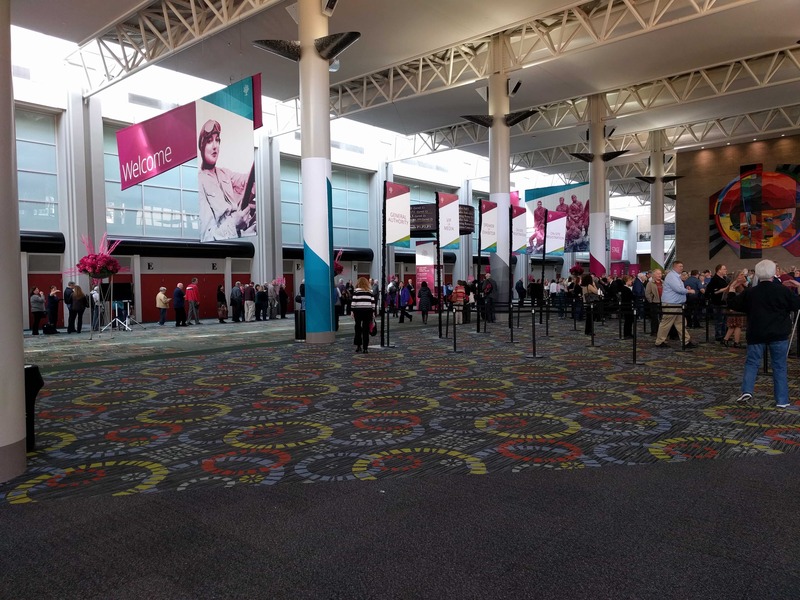 RootsTech 2018 features several classes on organization and I’m teaching two of them – one for the Getting Started track and one for the traditional RootsTech track. I’d love to see you there! As a RootsTech 2018 Ambassador I receive a free pass for myself and one for a Family Locket subscriber. No purchase necessary to enter the giveaway. All you need to to do is first subscribe to our newsletter (if you haven’t already), then submit a question or tip about organizing your genealogy in the comment section below. This 4-Day Pass DOES NOT include airfare, hotel or the coverage of any other expenses. If the winner has already registered for RootsTech 2018, the original registration fee will be refunded. Complete your entry by Thursday, November 2nd, 11:59 MST. A winner will be drawn randomly from the entries on Friday, November 3rd and announced on the FamilyLocket Facebook page. We will also contact the winner by email. I wish I had known this when I began to collect digital files: label each and every file, whether a jpg, PDF, or other, with the same naming convention. My preferred style now is last name-first name-maiden name if applicable-date-type of document-place if known. This makes things so. much. easier to find! I agree, having a naming protocol for your digital files saves so much time and energy. Thanks for sharing your tip. Good luck in the drawing! Your class sounds like just what I need. I inherited my mom’s & dad’s papers, files and photos. Whew. I am working on scanning all the photos. But WHERE do I go from there? I would love to be entered in the drawing. Inheriting everything is such a blessing, but can be so overwhelming. I’d love to have you in my class and give you some ideas of what to do. Good luck in the drawing! Sometimes it is very overwhelming to organize your family files. Using a color coded system has been helpful, since I am a visual person. I also have four main digital folders and then divide them down my families and this has helped organize my digital files. I also have an unknown folder for those we don’t know anything about yet. So excited for Rootstech! Kimberly, I love that you figured out a system that works for you. Color coding is perfect for the visually minded. Good luck in the drawing! I got the best tip from my friend Shelley Murphy. She taught me to create a 6 sectioned pronged legal file for each ancestor set up with the same information in each section. It has been so much easier to find what I need. Jen, That’s so interesting. I’d love to know what each section in your file contains. Good luck in the drawing! Surname-Given names-Birth Year-Event-Event Date-Location of Event (State-County-City). In addition to being on my computer each document and/or photo is added to Evernote with the appropriate tags added. That way I have access to all of them nomater where I am at. I would love to take your class. Hopefully I win the registration so that I can take it. Unless I win a free registration ( I am entering the drawing for all i can find) I will have to miss Rootstech and won’t be able to take your class. I use Evernote as well. It’s a fabulous way to organize and the tagging feature is so valuable. Thanks for sharing your digital filing system. Good luck in the drawing! I currently use Picassa to gather all the photos on the computer into one place. I really don’t like it. Can you recommend something that will do the same job as Picassa on my desktop computer? Photoshop Elements is an alternative for a desktop program, but it does come with a price tag and you may not like it any better than Picasa. I have an older version of Photoshop Elements that I use primarily now for editing photos. I keep my photos organized in folders on my hard drive and backed up to an external hard drive. I also have them uploaded to Google Photos for easy access on all of my devices. There are some classes at RootsTech 2018 devoted just to organizing photos. Good luck in the drawing! for now I just put all the documents under the persons name in their ancestry gallery. Saving all the documents in your Ancestry tree is actually a really good way to organize them. I also download the document images and save them on my hard drive via Google Drive. Good luck in the drawing! I still have most of my family history research in paper format, in binders by family or surname. I would love to digitize it all, but not sure the best way to name and electronically file it all. I would love to hear your techniques! It would be fun to join your class at RootsTech 2018! I’ll be sharing some of those ideas in our last study group session! Once you have a system set up, you can gradually make the conversion. Good luck in the drawing! I’m dying to get organized. My disorganization is driving me crazy and I know it wastes time. I think being overwhelmed and trying to find a system and a starting spot to focus on in simple steps is what I need. And then creating blocks of time, dedicated time each week to work on just organizing. I’m in charge of organizing classes at our Family History Center and for next year I’ve decided that each month will have a theme, like January will be Technology and I’m thinking February will be Organization as I have heard feedback from Patrons how they struggle with this. I went to some of your classes at BYU this summer and really enjoyed them. I just need to commit to putting what I learn into practice! Thanks! ps I think we need to have a document, some kind of Living Will For Family History so that if something happens to us we leave instructions on what to do with all those boxes of papers we haven’t got to yet! 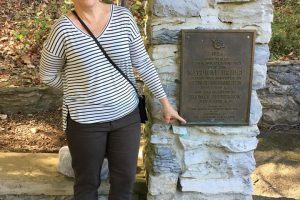 A living will for family history is brilliant idea! I agree that we need to consider who will inherit our stuff. I’m glad you enjoyed the classes at BYU and I hope to see you at RootsTech. Best of luck in the drawing! Thanks for the opportunity to win! I’d love to go to Rootstech! I inherited my mother-in-law’s family history records, most of it pretty disorganized, and I’m just not sure what to do with it!! I don’t want to throw it away, but I can’t really get much use out of it either! Good luck on the drawing! My class can definitely help you get started. RootsTech is a great place to be inspired and learn. I have researched for many years, pre- digital age and in the digital age. Before using digital formats, I used binders for my research. I essentially have created the same system on google drive. I store information under each surname, and each surname is divided by family group records. I had a section for each of the following. 7. GPS charts- I use tables & graphs to analyze my research. Thanks for outlining your organization method! You’ve put a lot of thought into what to include under each surname. Thanks for sharing and good luck in the drawing! When digitizing BMD’s on my computer, I use color coding files with File Maker which is free to download. My Genealogy file is marked with Black. Inside this folder are all of the surnames I am working on and they are all marked with a blue folder. Once I open one of the Surname files, everyone I have in my database is listed with a red file. Once I click on someone’s red file I can enter their birth, marriage or death record. When I have all three that person’s folder is turned to green. Kim, What an innovative way to organize your digital files. Thanks for the idea and good luck in the drawing! To keep track of documents and pictures I created a digital file system on my computer, by surname and within that folder by person, for each direct ancestor. I keep digital copies of each document and picture associated with the ancestor. If it applies to more than one ancestor, I use an alias filename, not a duplicate file. Susan, I do much the same thing with my digital files. It’s such a great way to organize. Good luck in the drawing! My tip: We call it the 3X3 project. Three times a week for 30 minutes work on a project. Perhaps you have photos stored electronically and it seems like it will be forever to identify them. Enter the 3X3 project. You’ll be done in no time. The 3X3 project sounds like a fabulous idea. Making progress on projects is so invigorating.Good luck in the drawing! My organizational tip is really low tec. I keep a binder with old-fashioned college-ruled notebook paper and a zipper pencil container with pens, pencils, reading glasses and a dollar store calculator. I take it with me whenever I am doing genealogy. I even take it to church because I am a family history consultant and I make notes about other people’ families. I also love keeping research logs and reports in GoogleDocs so they are with me wherever I go. Google Docs are the best! Ilike the balance between technology and a good old fashioned binder. Sometimes a balance is best. Good luck in the drawing! hi – I am such a beginner. I don’t even know! But I do have a lot of paper copies of things in a binder. Should I scan them so that they are digital copies? Do I just leave them in a binder? But really I am not sure where to start. Thanks. Looking forward to learning more. Hopefully – I win a seat! Annie, I prefer going digital for many reasons, mostly for ease of use and the ability to share. You can see my post about getting organized (link below). That will give you some ideas to get started. Best of luck in the drawing! I am planning on attending your class. I have recently been inspired to do a do over on my family tree. I am in the process of setting up a Master Genealogy file on my computer and have set up many specific sub titles under that one. I have already noticed how much easier it is to find a document. Previously I did not file the saved information under any title. They were all just in one big mess under documents. Any help I get would be appreciated. I am determined to get organized so that those who come after me have an organized trail to follow. Judith, I’d love to have you in my class! 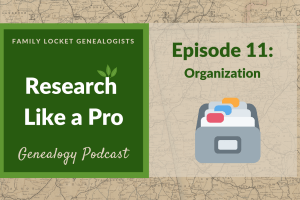 Getting organized is one of the best things you can do for the future of your family history. Good luck in the drawing! I have 36 boxes of photos, family group sheets and family history materials. When I start working on a box my mountain of family history papers seem to grow instead of getting under control because each item I look at seems to generate more questions and more projects! What can I do to take care of this wonderful stuff in a wise, efficient and manageable way? Thank you for the opportunity to improve – I would love to be entered in the drawing. Julie, I agree there is always something new to learn with organizing our genealogy. Good luck in the drawing! I am still trying to get organized. It took a lot of time to set the process and plan so it would be consistent and easy to remember. I am creating a new tree that is accurate and well sourced. In the process of doing this I have found research questions and followed the process for Research Like a Pro. by doing this I have found so much more information and I no longer feel like I am chasing the shiny things. Organization for me is just filing all of the information I have in a consistent manner.